We define the Sequel Trilogy Era as the time period just before, during, and just after the years in which the sequel trilogy films, The Force Awakens, The Last Jedi, and Episode IX, take place. For all the adventures in the Star Wars Sequel Trilogy Era and the order they take place, just scroll on down! Bloodline (Novel): The Force Awakens returned the world to the Star Wars universe thirty years after Return of the Jedi, with the New Republic warily eying the First Order, and between them, the Resistance led by General Leia Organa. Written by Claudia Gray, Bloodline is set less than a decade before that film, and reveals the how and why Leia left the career of a senator for the life of a rebel once again. Before the Awakening (Novel): The three heroes of The Force Awakens, Finn, Rey, and Poe Dameron, did not emerge from a vacuum, and Greg Rucka provides three short stories detailing the lives of the trio prior to their appearance in the film. For Finn, its his training as a stormtrooper in the First Order, for Rey, its an attempt to do more than survive on Jakku, and for Poe Dameron, it’s his recruitment by Leia to join the Resistance and take on the mission to find Lor San Tekka. Poe Dameron (Comic Book): The best pilot in the Resistance, if not the galaxy, earned his own ongoing title from Marvel Comics. 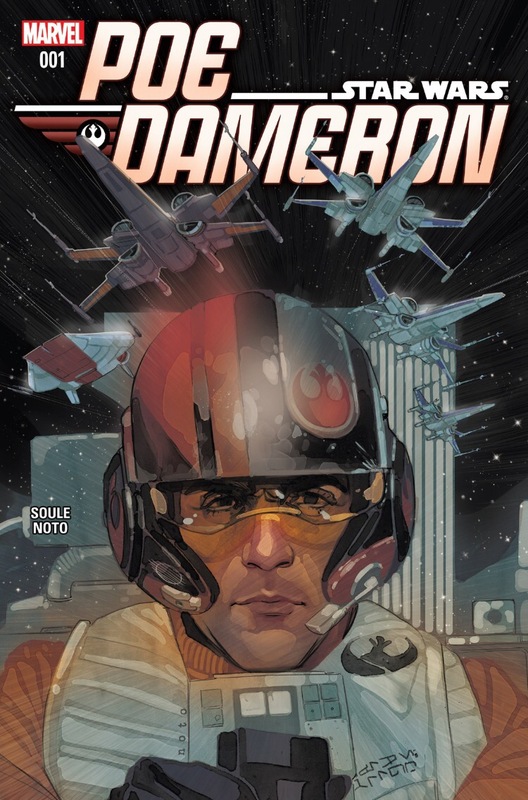 Written by Charles Soule with art by Phil Noto, Poe Dameron follows Poe Dameron on his mission to find Lor San Tekka. Aided by his fellow flyers of Black Squadron, Dameron faces off against an agent of the First Order on the same mission, Agent Terex. The Force Awakens (Comic Book): A six issue comic book adaptation of The Force Awakens offers a slightly different telling of the first film of the sequel trilogy. Aftermath author Chuck Wendig penned the series while Luke Ross offers an alternative visualization of the film’s events. Captain Phasma (Comic Book): How did Captain Phasma escape from Starkiller Base after being thrown into a garbage compactor? This miniseries reveals the escape and the lengths that followed by Phasma to track down the First Order soldier who witnessed her deactivate the shields of the base that allowed the Resistance fighters to strike at the First Order’s super weapon. Canto Bight (Novel): An anthology of stories set in the city of Canto Bight just before the events of The Last Jedi with contributions by John Jackson Miller, Saladin Ahmed, Carson Rae, and Mira Grant. Dive deep into the people and culture of the resort city and playground for arms dealers from across the galaxy. DJ: Most Wanted (Comic Book): Embodying his motto, “Don’t Join,” DJ: Most Wanted is a one shot issue about The Last Jedi‘s non-committal slicer set just before the events of the film. The Last Jedi (comic): An adaptation of the film, it features new scenes and perspectives of existing scenes of the The Last Jedi.